Commodore Matthew Perry (1794-1858) - By the mid-19th century, Japan had been a closed society for over 200 years; that is, it did not permit outsiders in, nor did it allow its own citizens to leave (there were exceptions of course). It was a policy known as Sakoku. But that changed in 1853 with the arrival of Commodore Matthew Perry from the United States. On July 8, he anchored four ships in Uraga Harbor near Edo (present Tokyo) and declared Japan open for business. Japanese officials directed Perry to Nagasaki (the only port of entry for foreign ships), but he refused to leave. Perry had studied Japanese culture and calculated that a show of strength would be most effective. He threatened to open fire, and if attacked, warned that more American ships would follow. After several tense moments, Japanese officials agreed to meet with him. He presented a letter from President Millard Fillmore formally requesting the establishment of trade relations between Japan and the United States. Perry then departed, leaving them to consider the request and a promise to return for an answer within months. The next year he did return with twice as many ships, prepared for a conflict. To his surprise though, the Tokugawa shogunate, the de facto rulers of Japan, agreed to open trade with the United States on a limited basis. In addition to Nagasaki, the port cities of Shimoda and Hakodate were made accessible to foreign ships. 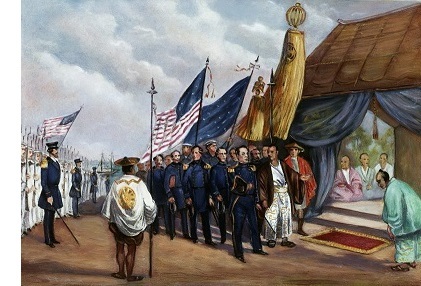 On March 31, 1854 the Treaty of Kanagawa was signed and Japan's isolation was ended. Although it is generally considered a dark day in Japanese history (in fact Perry's ships are often referred to as "Black Ships"), it is also credited with ending Japan's feudal system and helping the country close the gap technologically with the West.